We decided to rest today since tomorrow was to be another long day. This gave us the opportunity to meet and chat with some of the other campers. I met 3 great gals – Emily, Sue and Sally and they were such fun to visit with. Emily came over to our site and gave me the name of a very knowledgeable trail angel Kate who erected the many sign in the Three Sisters Wilderness. After quizzing Kate I was able to find out that the trail to <?xml:namespace prefix = st1 ns = "urn:schemas-microsoft-com:office:smarttags" />McKenzie Pass was difficult but possible. She told me how she had taken her 3 year old colt over it recently. I heard about the Obsidian glass cutting right through horse’s boots as well as the demanding lava stretches and was assured that Issy would be okay. Almost 30 miles to go from Quinn Meadows Horse camp to McKenzie Pass but it was all along the Three Sisters Wilderness so I was happy to finally be able to see the renowned wilderness. Three Sisters is geologically one of the most diverse areas in Oregon with the Cascade volcanoes of South Sister, Middle Sister and North Sister along with The Wife, The Husband and Little Brother. There are glaciers, miles of different types of lava and of course the Obsidian glass like rocks. Burton dropped us off and I headed for the PCT but somehow ended up going around a butte and then got to the Wickiup Plain. After two hours of searching the PCT sign was a welcome sight although passing along the different trails was beautiful and I knew I was heading in the right direction and was vaguely in the right area. I probably could have continued on a trail I found earlier but I wasn’t sure and it was a long day and didn’t want to add any unnecessary miles. The scenery was indeed breathtaking with snow capped mountains, lakes and creeks. We hugged the west side of LeConte Crater which was a solid wall of lava then passed into the forest. A huge tree had fallen across the trail and it made my saw look like a child’s toy. Absolutely no way to cut anything that big but luckily there was plenty of room to pass. We travelled on and switch backed down to Mesa Creek with its adjacent meadow. Every direction was a picturesque delight, crossing Separation Creek, through the meadows and back up. A sign confirmed that we were passing the Linton Trail as we continued on and met a family of hikers who gave Issy carrots. Climbing the divide the snow was deeper and worrisome but passable. A couple of other hikers were heading south so I asked them about Obsidian Falls and wanted to know if it was possible to miss. They told me they just came from there and the trail was in front of me a short walk farther. I wanted to see the falls if possible but wasn’t going to use Issy up to get there. No problem because we rode right above the falls and I was able to get a wonderful view not even having to leave the trail. A gal and her boxer with green booties were resting at the base of the falls, but we just passed above them barely noticed. We traveled over the black obsidian rock which I was cautious about but it sounded worse then it was. I checked Issy’s boots and they were holding up fine. But then the real boot challenge was yet to come. The tread became solidified lava and we crosses several ridges on the way to Minnie Scott Spring, then on to Scott Trail. A friend (Ed) had told me when I complained about the lava in southern Oregon that I hadn’t SEEN lava yet. He was sure right! I had no idea that we were to cross miles of the rugged footing and when it appeared that we were finished there was more over the ridge. You couldn’t see the tread and could hardly believe that a trail even existed. I found a strange, surreal beauty in all the miles of lava but was glad to finally get to real terra firma! A sign to Lava Lake Camp finally directed us to our camp where Burton had already set up. I noticed a homemade sign saying that a trail angel was camped there as well and it turned out to be Okie Girl who was at Walker Pass last year when we came through. which was built entirely out of lava rock by a packer who helped build trails for the forest service in the 30’s. The observatory showcases all of Oregon’s major peaks and each window frames a different mountain. Looking out at the field of lava ahead no trail was visible but I tacked up Issy, walked a bit on Hwy 242 and found the cut through trail to the PCT. There was a trail register and water had been left for hikers since water was said to be nonexistent for the next 16 mile. I rode for a short time but the lava was so rough that I just couldn’t add my weight to Issy’s. As before we fought for every step with ankles twisting, feet rolling on lava and no firm soil or tread. We both anxiously watched for a flat rock to place our feet level just to rest. Looking forward or back was all the same, just miles of lava! I was amazed that Issy was so good about the footing and never stumbled. Still the strange beauty of the lava fields awestruck me knowing that someone had to be the first adventurer to try to pass through. 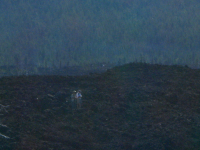 I took a picture of two hikers who were heading south and you could barely see them because of all the lava. Finally, we got to a forest oasis but a fire denuded the landscape and only silver colored tree skeletons were upright but the forest was trying to rejuvenate and Issy was able to graze along for a few miles. I started to look for the side trail to Washington Pond on Mount Washington and soon was heading straight up mountain with Issy pulling as he does when he knows we are close to water. We found Washington Pond and relaxed for several minutes eating and drinking. Going northward we crossed old roads and ski trails finally arriving at Santiam Pass at Hwy 20 where we crossed and angled northwest to the trailhead where Burton was waiting.